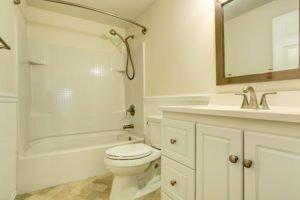 This is Part 2 Of Our 3 Part Article About How To Make Any Bathroom Appear Larger. This Is Done With Decor, Not A Bathroom Remodel. You Can Purchase From Us, Or Buy Your Own, Bring It Home, & Call Us To Install. (Call us before you buy to ensure we can install it for you). Small bathrooms are common in 1960’s & 1970’s DFW homes. 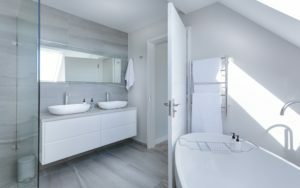 Particularly if you have an older luxury home, a small bathroom poses a challenge that can’t be resolved. Short of adding a room addition, the only option is to make the bathroom appear larger. 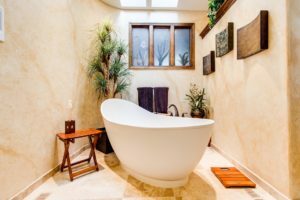 This 3 part article discusses 50+ ways to visually increase the size of a bathroom. Many are quite practical, others are uncommon. All ideas work together with the end result of having improved the appearance of the bathroom and making it appear larger. Increase The Lighting Brightness (often simply with brighter light bulbs) to make any bathroom seem larger. LED bulbs allow you to dramatically increase lighting without exceeded the fixture’s wattage maximum or generating much heat. In general, an LED bulb will use only about 10% of the wattage of an incandescent bulb. If the LED uses 10% of the electricity, it will generate only about 10% of the heat of an incandescent bulb. Increase Natural Lighting when possible. Later in this article, we give more ideas how to maximize the light coming in a window while still ensuring privacy. Other natural lighting options include adding a skylight, or Solar Tubes. Solar Tubes are polished metal tubes used to bring natural light into the room with much less expense than adding a skylight. Lighter Colors Expand The Visual Size Of The Room. If the bathtub & tile are in good shape, perhaps a professionally-applied epoxy finish present a quick and modest-cost solution. Everything will look new again + the grout lines are now covered with epoxy (this eliminates cleaning grout). Epoxy coating can also be applied to non-metal bathtubs. White-On-White: No color will expand a space better than white. On the other hand, all white can seem devoid of character, or look like a hospital bathroom. Tone-On-Tone: In most cases, white bath fixtures are the norm. Bone / off white bath fixtures are also a timeless color. With tone-on-tone color schemes, light shades of color are added to other surfaces. Tone-on-tone color schemes use closely related shades of one color. This allows visually seamless transitions that don’t stop the eye. As with white-on-white, fewer visual transitions (such as wall tile & adjoining painted wall) allow the eyes to see the room as a whole. This gives the illusion of a larger room. Fewer visual transitions make a space appear bigger. Create the illusion of more space by choosing the same color for your walls & ceiling. A white ceiling creates a notable visual transition. If you have white tile all the way to the ceiling, painting the ceiling the same color as the walls (provided they aren’t white) will take the eyes all the way to the ceiling where white tiles and colored ceiling meet. For a bath that’s narrow, using horizontal lines will visually enhance its width. Larger tiles visually expand the room due to longer grout lines. Ceramic and vinyl tile typically comes in: 12 in. X 12 in; 12″ X 24″; 18″ X 18″; & 24″ X 24″. Note: When the tile is longer in one dimension, it can be installed to visually widen the room’s smaller dimension. If the shower has a high profile, changing the type of floor tile in the shower visually breaks up the floor space. Use the same floor tile in the shower instead. Smaller tile in the shower is common because of the slope in the floor toward the drain. If a large tile can’t be configured to drain well, use a closely coordinating color for the shower floor tile, as shown in the link just above. Though typically the shower will have a “lip” (to keep water in) the same floor tile takes the eyes to the rear of the shower, versus the eyes stopping at the lip. As with the floor tile, the same wall tile continued into the shower keeps the eyes moving to the back of the shower, versus stopping at the front of the shower. Many homes have “Home Builder Mirrors” that sit on top of the vanity’s back splash. So what to do if you have one of these mirrors? You can change it out, or dress it up with a frame designed for that purpose. Often times, the backing on the mirror near the bottom has failed from being wet. The right frame can also solve that problem. Click Here To See An Example Of Adding Horizontal & Vertical Lines By Framing A “Home Builder Mirror”. Increase Mirror Size To Increase The Amount Of Space That It Reflects. Increasing mirror size will visually double the space that is reflected in the mirror. The impact is further increased if a window is reflected. Adding long mirrors to doors can visually enlarge a bathroom at various locations. What’s more, door mirrors that reflect a window or light fixture will have an additional impact. Door Mirror Options are nearly endless. We show only one, as it’s a simple design that works with any door. It’s 48″ long x 12″ wide, and has a beveled edge. To install this mirror, you will need mirror mounts. They are shown just below the mirror. Note: If you choose a framed mirror, choose a white frame for a white door OR match the frame to the bathroom hardware (faucets, towel bars, etc.). Draw The Eyes To The Farthest Point In The Room From Where You Enter. If Your Bath Has A Window — Make Sure The Light Comes Through. Of course we all want privacy in a bathroom, but there are better ways to ensure privacy while not blocking the light that would come into the bathroom. Below are 3 examples of (non-permanent) Static-Stick Privacy Films. You can go as simple as white matt, or make a decor statement with other patterns. If the window is a Focal-Point in the room, perhaps the more vibrant patterns would be best. There are also films that look like stained glass. If the window is not a Focal-Point, a simple pattern is best to ensure the eyes are not drawn to the window. Blinds can be opened toward the ceiling, allowing light in while maintaining privacy. Depending on the configuration of your bathroom, if you won’t be between the window and the lighting, a light-filtering shade will provide total privacy while allowing most of the available light into the room. No Window? Add A Mirror Above The Bathtub To Reflect Light. If you have a separate shower & bathtub, you can hang a mirror over the bathtub. In most cases, you face the bathtub as you enter the room, this will draw your eyes through the room. If you have a bathtub with shower head, you can install a wide & short mirror above the tile. This is often where a transom-window is located, and you can emulate that look. While the picture in the link below is an ornate, antique mirror, it still demonstrates the look. The Mirror below comes in black, white, gray or gold. It’s 30″ wide by 13″ high. A typical bathtub is 60″ wide, so 2 of these mirrors creates a “transom-mirror” that spans the entire width of the bathtub. If you have a free-standing bathtub, an over-sized mirror sitting on the floor behind it will give a similar affect as a mirror hanging on the wall. If you need a mirror that does not have to lean on the wall, the mirror below includes a stand. If You Have A Window — “Double” It By Adding A Mirror Reflecting It. This was Part 2 Of A 3 Part Article About How To Make Any Bathroom Appear Larger. It is done with decor, not a remodel of the bathroom. Al’s Plumbing, Heating & A/C, in Plano, Texas provides full service plumbing maintenance, repairs and replacements for every plumbing component in your home. Al’s sells and installs Rheem Professional Series gas & electric water heaters, and tankless water heaters. Al’s Plumbing, Heating & A/C is near your home in McKinney, Frisco and Allen, TX. We service all homes in southern Collin and Denton Counties with no additional travel charge.